If you watched the Champions League quarterfinal first leg between Ajax and Juventus at the Johan Cruijff ArenA, you can be forgiven for feeling a sense of déjà vu. In the Round of 16 first leg at the fabled venue which capitalises you coming and going to mimic the stadium’s dual arches, Karim Benzema scored the opener for the visitors only for Hakim Ziyech to find an equaliser 15 minutes later. On Wednesday evening, Cristiano Ronaldo struck on 45 and David Neres levelled for the home side in stoppage time’s second minute. Events were spread out in the first match with the first goal coming on the hour. In the quarterfinal, everything happened just after some fans left their seats early to be first in line at the concession stand. The overpriced meat pies surely lost their flavour when their owners returned to their seats to find the important moments had occurred without them. A late winner from Moise Kean or Federico Bernardeschi to complete the parallel and provide some cold comfort wasn’t forthcoming. I did say déjà vu rather than carbon copy. The point here is that Ajax aren’t intimidated by the depth they’ve reached in the tournament or the opposition’s pedigree. Why should they be? The Lancers boast a substantial legacy themselves. Economic reality makes them a feeder club these days, but the four-time European Cup winners treat that role like they did European football in the early 70s. They are the standard bearers. It isn’t easy to remain competitive while fielding a roster split between young academy talent [both theirs and rivals’] and prodigal sons returning home in their 30s for one last contract, especially when you sell the best youngsters while they’re still in their teens or barely into their 20s. It takes incredible commitment throughout the organization to consistently contend. Winning Eredivisie titles is gravy. So is reliving the old days by making Europa League finals and late Champions League rounds to battle fellow legends such as Real Madrid, Juventus and Manchester United. Knowing their top talents won’t be around long, Ajax managers must strike while the iron is hot. Erik ten Hag has done exactly that. More importantly, he’s striking to the heart. His side emerged from the last international break with renewed purpose. They defeated Eredivisie leaders PSV Eindhoven 3-1 to take over the top spot. Two goals came after right-back Noussair Mazraoui was sent off and Luuk de Jong equalized for PSV. A man down, former Southampton man Dusan Tadic tallied the winner on 72 minutes. David Neres added some late insurance six minutes into stoppage time. Strolls through Emmen and Tilburg followed before Juventus arrived in Amsterdam. The Godzonen came into the match on the back of outscoring their last three opponents 12-4 on aggregate. Ajax is already on the domestic century mark in scoring even though their two stars, Matthijs de Ligt and Frenkie de Jong, are a defender and deep-lying midfielder . PSV remain level on points in the Eredivisie but trail by nine in goal difference. Coincidentally, they trail their rivals in Eredivisie crowns by the same amount. Eindhoven owned the Dutch league in the new millennium until Frank de Boer resuscitated Ajax with a four-title run from 2011-14. PSV picked up where they left off when De Boer decamped for Milan, London and Atlanta in a thus far vain search for greener grass. The former Ajax and Barcelona defender’s failures abroad highlight the importance of the Ajax organization. Many, including myself, believed De Boer might be the next Louis Van Gaal, Ruud Gullit or Frank Rijkaard, kickstarting the club’s stalled but long list of exported tacticians that began with Rinus Michels and Cruijff. 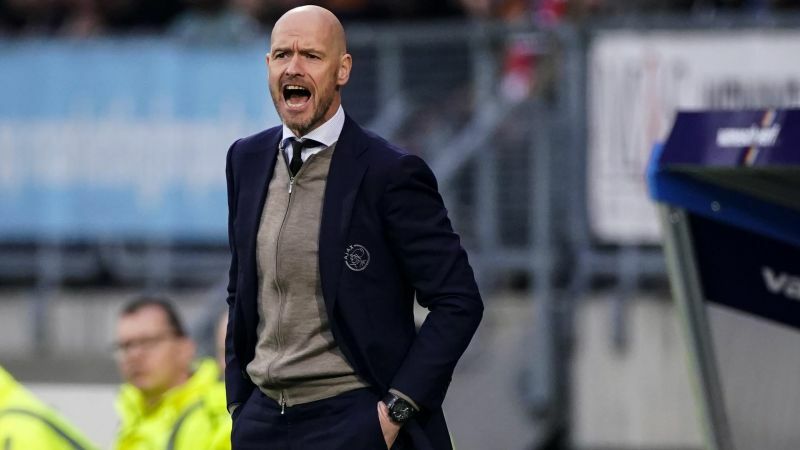 If Ten Hag can win out the season’s final five matches against Excelsior, Groningen, Vitesse, De Graafschap and Utrecht, he will end Ajax’s four-year title drought. Unlike De Boer, the 49-year-old isn’t an Ajax alumnus. His playing career consisted of three spells with Twente and time with Waalwijk, De Graafschap and Utrecht. His first managerial job came at Go Ahead Eagles on minority owner and current Ajax Sporting Director Marc Overmars’ recommendation. From there, he handled the Bayern Munich B team for Pep Guardiola before signing with Utrecht. Overmars kept tabs on Ten Hag and tapped him up when the club sought a mid-season replacement for Michael Reizeger last season. Ajax alum or not, Ten Hag is proving an astute hire. His affiliation with Guardiola probably explains Ajax's prolific scoring in 2018/19. Similar tactics, similar results. Like his star players. De Jong and De Ligt, suitors may soon be knocking on the door seeking the gaffer's services. While he is yet to complete a full campaign with the Lancers, Ten Hag's work this year makes him the latest Dutch strategist to be touted for bigger things. It didn’t work out for De Boer. Ronald Koeman is rebuilding his reputation with the national team after a disastrous turn with Everton. Danny Blind previously proved he is a career assistant with the Oranje. The last Dutch boss to make serious noise was Bert van Marwijk, who led the nation to the 2010 World Cup final. Negative tactics underscored by Nigel de Jong’s flying kick to Xabi Alonso’s midriff shocked a world accustomed to total football's positivity. Van Marwijk was sacked by Saudi Arabia after qualifying the Green Falcons for the 2018 tournament in Russia. He took over Australia at the last minute when Ange Postecoglou absconded to the JLeague. Argentine Juan Antonio Pizzi oversaw the Saudi’s opening match debacle against Russia in his place. His current whereabouts are unknown but Bertie is back in the desert, managing the United Arab Emirates. That is the nature of football management. One moment, you’re the toast of the town. The next, if you don’t make good, you’re the answer to a trivia question. Erik Ten Hag approaches that crossroads in his career. Which path will open for him?